Senior Maddie Bledsoe ’18 earned Second Team All-NESCAC honors and was named the NESCAC Player of the Week three times. She was also a CoSIDA Academic All-District First Team honoree and was selected to play in the NEWBA Senior All-Star Classic. Bledsoe was the leading rebounder in the NESCAC all season and finished with 10.6 boards per game. Tara Berger ’19 was second in the conference with 7.6 rebounds per contest. For the second straight season, the Cardinals advanced to the semifinal round of the NESCAC Tournament, as the squad defeated Hamilton, 2–1, in the quarterfinals on Feb. 24, thanks to junior forward Andy Espinoza’s game winner with 1:46 remaining in regulation. The 13 victories are tied for the second-most single-season wins in program history, and the unit posted a winning record during its conference slate for the first time since the 2006–07 campaign. Dylan Holze ’18 finished in a tie for first in goals in the NESCAC (16) and second in points (26), as he was named a semifinalist for the 18th Joe Concannon award, in addition to earning All-NESCAC First Team recognition. Chad Malinowski ’19, who was phenomenal in all three zones, garnered All-Conference Second Team accolades, as he finished with three goals and 12 assists. After suffering a 5–3 loss to Connecticut College in season-opening action on Nov. 17, the group went undefeated in nine consecutive games (6–0–3) from Nov. 18 through Jan. 6. Tyler Wyatt ’20 (nine points, 16 assists) and Walker Harris ’20 (nine points, 14 assists) provided a great deal of scoring power for the group. In his first season at Wesleyan, Tim Sestak ’20 took the reins in net, finishing with a 9–6–5 record, to go along with a .929 save percentage and a 2.20 goals-against average. 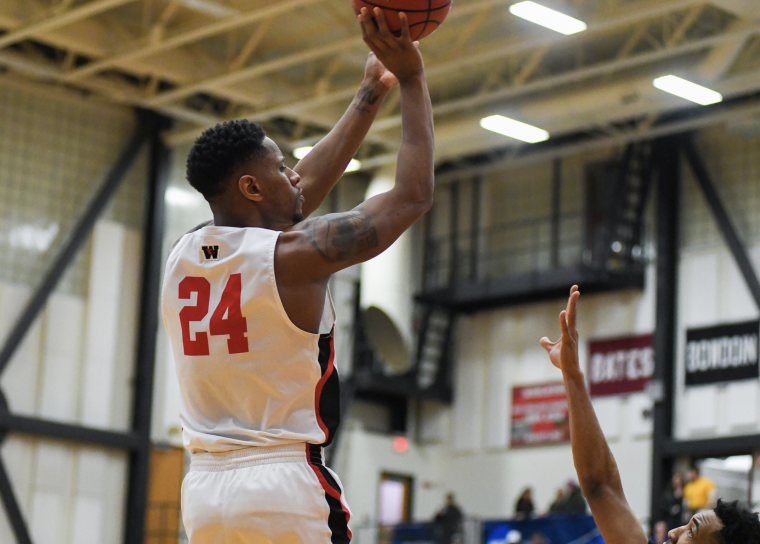 With two games remaining in the regular season, the Cardinals were outside of the playoff picture in the NESCAC, but the squad defeated then-No. 8-ranked Amherst, 2–1, on Feb. 16 at the Spurrier-Snyder Rink, allowing the team to qualify as the eighth seed for the second straight season. The win against the Mammoths was the first for the program since Nov. 22, 2003. Wesleyan defeated Hamilton, 3–1, on Jan. 20 in Middletown, Conn., as the Continentals entered the game with a flawless NESCAC record at 7–0–0. Allegra Grant ’20 continued her remarkable evolution in net, earning All-New England Division III honors from the New England Hockey Writers Association and All-NESCAC Second Team laurels. The Winnetka, Ill. native compiled a career-high 53 stops during a 2–2 draw against Little Three foe Williams on Dec. 2. Gina Mangiafridda ’19 led the team in goals (six) and points (12), while also contributing with six assists. Alexis Banquer ’20 was a consistent source of offensive production, finishing with four goals and seven assists, while Sarah Goss ’19 led the team with nine assists. Captain Alex Horton ’18 was a great leader on and off the ice for Wesleyan, while tallying the team’s lone short-handed goal. Finished the season ranked No. 31 in the College Squash Association (CSA) national rankings. Sean Choi ’21 was named the NESCAC Rookie of the Year and a First Team All-NESCAC selection. He became just the second Cardinal ever to receive the postseason honor, and the first since the 2011 season (John Steele ’14). Choi qualified for the Molloy Cup (B Division South) at the CSA National Individual Championships. He finished the season with an impressive 18–5 record in the No. 1 position. 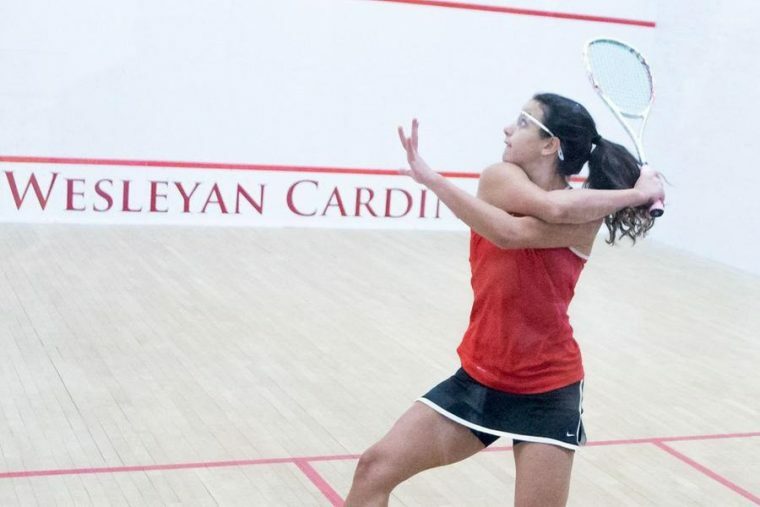 Laila Samy ’18 of women’s squash earned All-American honors and finished the season ranked 20th in the College Squash Association’s national rankings. Finished the season ranked No. 20 in the CSA national rankings. Samy was named the 2018 Betty Richey Award winner, which is the most prestigious annual award handed out by the CSA. She concludes her collegiate run with an incredible 83–1 dual match record, while posting a perfect 24–0 mark as a senior. Samy was also named the NESCAC Player of the Year for the second consecutive season and earned her fourth First Team honor. Samy, who was also the 2015 NESCAC Rookie of the Year, garnered her fourth All-American laurel as she was named to the Second Team. Wesleyan had two NCAA All-Americans for the first time in program history— Bellamy and Carrillo. It also marked the first time since 2012 that Wesleyan had an All-American wrestler (Jefferson Ajayi ’13). Bellamy finished third in the country at 285 with a 6–1 record at the NCAA Division III Championships, including three pins. He received the NCAA award for “Most Falls” with a total of 24—the highest in the country, among all divisions. Bellamy won the Northeast Regional title and posted a 38–3 overall record for the season. He received the New England Wrestling Association (NEWA) Most Dominant Award and was named a First Team All-NEWA honoree. Carrillo won the Northeast Regional title at 197 to qualify for his third NCAA Tournament, where he finished eighth overall. He concluded the season with a 37–5 record and 22 pins. In the NCAA rankings, which only counts pins against opponents in the same division, he finished with 21 to tie for third in the country. Carrillo earned First Team All-NEWA honors. Amir Daouk ’20, Zack Murillo ’19, James Matias ’19, Carter Armendarez ’18, and Dominic Pirraglia ’18 were named All-NEWA Honorable Mention. Armendarez, Bellamy, Carrillo, Daouk, Matias, and Murillo were named NWCA Scholar All-Americans. Wesleyan also earned an NWCA Scholar Team Award. 14 Cardinals were named to the Academic All-NEWA Team. The Cardinals broke four school records in relay events during the 2018 NESCAC Championship on Feb. 23–25 at Bowdoin, as Ali Pourmaleki ’18, Spencer Tang ’18, Aidan Winn ’18, and Alex Kapphahn ’19 set varsity records in the finals of the 200-yard freestyle relay (1:24.03) and the 400 medley relay (3:26.96). The group of Pourmaleki, Winn, Quinn Tucker ’20 and Phillip Wong ’21 shattered a varsity record in the final of the 800 freestyle relay (6:54.13), and then during the final of the 400 freestyle relay, Pourmaleki, Kapphahn, Tucker, and Winn set a new school record with a time of 3:06.33. 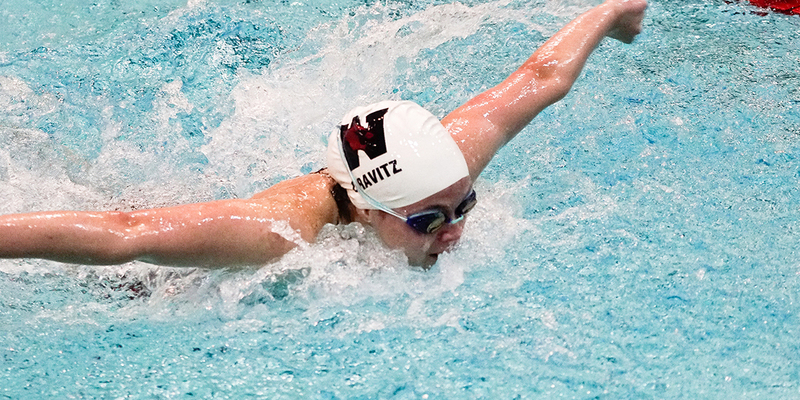 The Cardinals also broke plenty of individual records at the conference meet in Brunswick, Maine, coming at the hands of Pourmaleki (51.59, 100 backstroke; 50.12, 100 butterfly; 46.41, 100 freestyle) and Kapphahn (22.95, 50 butterfly). The women placed 17th at the NCAA Championship. Five Cardinals took their talents to the NCAA Division III Championship on March 21–24 in Indianapolis, Ind., as the group finished 17th overall in the nation, headlined by Murphy ’20 earning her first career All-American accolade behind a fourth-place finish in the championship final of the 100-yard backstroke with a school-record time of 54.97. Murphy, along with Zoe Kerrich ’18, Grace Middleton ’20, and Hannah O’Halloran ’20 collected Honorable Mention All-American acknowledgment in the final of the 400 freestyle (school record, 3:26.29) and the 200 medley relay events. Devon Cooper ’19 suited up for the NCAA Division III Zone Diving Qualifier at Middlebury College on March 2–3, as she placed 15th overall in the 3-meter event (378.50) and 22nd off the 1-meter board (348.50). The Salinas, Calif., native set a school record during the 2018 NESCAC Championship, compiling an outstanding score of 397.60 in the championship final off the 1-meter board. During the 2018 NESCAC Championship at Williams on Feb. 16–18, Murphy earned individual-champion honors in the 50 and 100 backstroke events. Andrew McCracken ’19 recorded a school record of 4.60 meters during the pole vault at the Smith Invite on Jan. 20. Grant van Inwegen ’20 finished the 1,000m in a school-record time of 2:30.35, which was good for fourth overall during the Fast Track Last Chance meet on Feb. 24. During the New England Division III Championship on Feb. 17, the unit recorded five top-13 finishes, as van Inwegen grabbed sixth-place honors in the 1,000m, and freshman Kevin DeLoughry checked in at the ninth slot during the 400m. Ivie Uzamere ’21 broke the school record in the weight throw four times during the winter season—most recently with a mark of 17.45 meters during a second-place effort at the Last Chance Meet on March 3, as she qualified for the NCAA Division III Indoor Championship in the event. Wesleyan placed eighth overall out of 30 teams during the New England Division III Championship on Feb. 17, headlined by Jenny Aguiar ’19 taking home first-place acknowledgment in the 600m, while Uzamere earned runner-up honors in the weight throw and shot put. The group also grabbed a second-place finish out of 16 teams during the Branwen Smith-King Invitational on Jan. 27, as the Cardinals compiled 19 top-10 finishes at Tufts in Medford, Mass.